... and some (including today's NY Times article) are predicting that, as with the iPod and iTunes, the tablet will turn the status-quo of media consumption on its head. The days of free newspaper and magazine content online are coming to an end (not necessarily a bad thing). Amazon's days of mass power over digital content pricing are dwindling (definitely not a bad thing). Furthermore, this will hopefully give media companies - magazines, newspapers, websites, publishers - a chance to go back and fix the mistakes of digital content readers past (absolutely not a bad thing). But what is a bad thing (I think) is the power that the tablet will hand over to Steve Jobs - yes, the selfsame man who claimed that the Amazon Kindle would go nowhere because "people don't read anymore." And how wrong he was -- book apps recently overtook game apps as the bestselling category on the App Store for iPods/iPhones. In light of Jobs' earlier comments on reading and e-readers, the tablet seems a bit like back-pedaling, no? Despite my cynicism, however, I do believe that the tablet - whatever it may look like and however it may work - will revolutionize the world of digital access, and that revolution gives new hope to the media world: just as we knew the music industry could not continue to stand on its feet if Napster remained the main source of music for the world, we now know (perhaps a bit too late) that newspaper and magazines cannot survive if 100% of their content is available online for free. We also know - well, some of us do - that publishing companies cannot survive if e-books are valued at only $9.99; the price of book is more than the sum of printing and shipping costs. The mere fact that the tablet has successfully created so much buzz before even being officially announced lends credence to the theory that it will stand the industry on its head. Amazon, look out - looks like you're not the only fish in the sea anymore. What that will mean in the long run, though, we have yet to see. What do you think the tablet will do to the market? Or rather, what do you hope the tablet will do? I couldn't agree more. Happy Sunday!! In my many internet wanderings, I've stumbled across a fair number of odd and fantastic gadgets and gadget covers; this one takes the cake, by far. Thank god I have a MacBook (I never thought I'd actually be so glad to have a dysfunctional, out-dated and over-priced piece of gadgetry). Read... set... turn your laptop into a book! You can get this laptop cover (and some other, less cool, laptop accessories) at Twelve South. 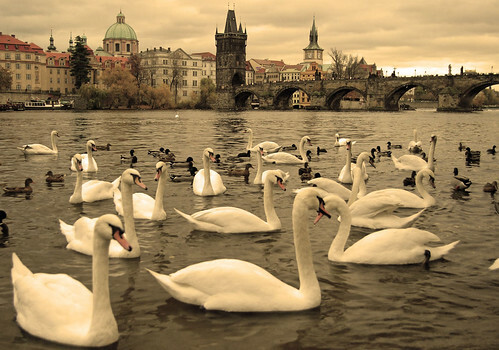 Ok, this isn't strictly books-related, but a friend of mine is auctioning/raffling off one of her -amazing- photographs from Prague to support the relief efforts in Haiti. Rules and details are available on her flickr page, where you can also place your bid. If you aren't a flickr member, you can email your bid - information available in the rules. Here's the image... I told you it was amazing. It's been a week since the earthquake in Haiti, believe it or not. The country is now estimating a death toll of 100,000-200,000 people, over twice the original forecast by the Red Cross. According to an ABC article yesterday, the Haitian Prime Minister announced that over 70,000 people had been buried in mass graves. Slowly but surely, the search for survivors is being given up as we pass out of the window in which survival is even a possibility. Booksellers R. J. Julia (the same store that runs the Just the Right Book! program) and Northshire Bookstore have donated profits from signups and renewals for store club memberships to Doctors Without Borders (from today's Shelf Awareness). Partners in Health has provided extensive medical support to the region. Founded by Dr. Palmer, who is the subject of Tracy Kidder's bestselling title Mountains Beyond Mountains. Books on the Nightstand gives recommendations for reading about Haiti. Not sure how to help? Charity Navigator will help guide your donation to the right place for you, and can prevent your money from going to a scam, which, sadly, tend to pop up left and right during times of need like this. You can also donate $10 to the Red Cross by texting "HAITI" to 90999. As a side note, this text campaign has been hands-down the most successful campaign of its kind, perhaps ushering in a new era of philanthropic giving. Read the full Washington Post article on the subject for more details. I always think it's cool when people come up with new, innovative ways to decorate with books. (Maybe I'm biased because my own dresser is lined with books at varying heights, atop which my makeup, jewelry, etc. are perched in precarious positions.) 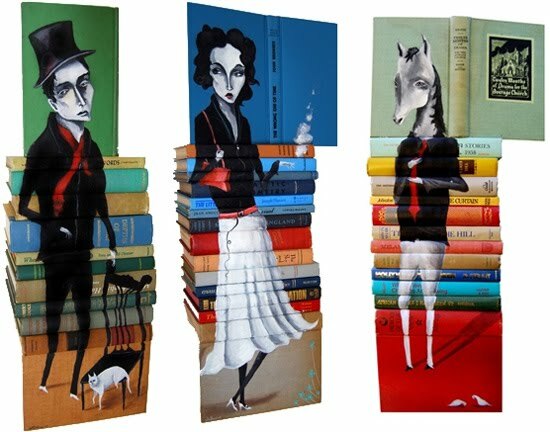 Artist Mike Stilkey, however, takes the cake for now, with his ingenious art-on-books display (featured in today's Shelf Awareness, and originally posted on This Blog Rules). Check out the full article on This Blog Rules for more info and pictures. This second novel by Sarah Blake, The Postmistress, tackles the tricky questions of love, separation, war and persecution in a mere 330 pages. Too much, you ask? It easily could have been, but Blake's crisp writing gets to the heart of the matter, bringing home the heartbreaking story of four characters during the early years of World War II. With Roosevelt's promise to keep American soldiers out of "foreign wars" still reverberating across the US, radio anchor Frankie Bard sets off for London to report on the Blitz. Her travels take her across Europe on trains as she follows the Jews fleeing their homelands; the fact that the reader knows the significance of the chaos on the trains while Frankie still tries to sort out its meaning only makes it more impressive. She captures her own voice, and the voice of hundreds of others, on her tape recorder, playing these stories back to America, bringing home the terrors and horrors of the Blitz and the impossible beginnings of the Holocaust. These voices reverberate through the town of Franklin, Massachusetts, the farthest town on Cape Cod. 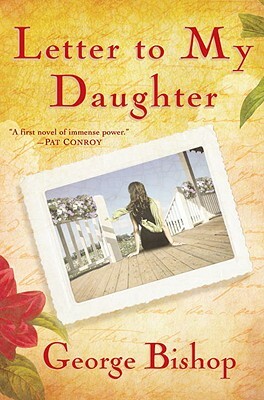 The stories of the postmistress, Iris, the doctor, Will, and his wife, Emma, all carefully overlap with Frankie's, and the four become tied together by happenings as fine as a string when Will leaves for London to help the injured of the city. Iris relays daily letters between Will and Emma, and Emma and Iris continue to listen to Frankie's harsh tellings of reality in London. Frankie and Will meet in a bomb shelter, and Frankie and Iris both face the decision of what information to pass on to grieving, yet hopeful, families. Blake's novel is historical fiction at its finest: it transports the reader flawlessly back into the year 1940, and simultaneously drives home the terrific human toll of the Blitz and the chaos and lack of understanding of the persecution of the Jews in Europe. This is World War II history, albeit fictionalized, on a very personal level, and it is the little stories buried with the larger plots of The Postmistress that make the story the masterpiece that it is. The little boy in London who ran home after a night of heavy bombing only to find that his home - and his mother and grandmother - have simply ceased to exist in favor of a crater. The widow in Cape Cod recognizing her late husband's childhood overalls on a fisherman's son. A German immigrant staring East over the Atlantic, as though his missing wife would walk right off the water into his waiting arms. 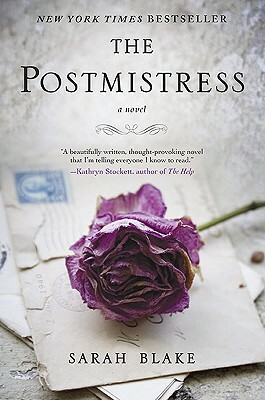 The bottom line: The Postmistress is far from uplifting, but in addition to being an excellent story, and a well-written one at that, it is one that puts the reader in touch with an important, and often overlooked, aspect of history. There is more to war than battle orders and armored vehicles, and Blake's story ranks among the highest in telling the human side of World War II. That being said, the novel, and Blake's ideas, are fresh and lucid, not bogged down in repetitions or emotions of past accounts. Highly recommended. Well, I have another resolution to add to the (ever-growing) list: avoid reviewerspeak at all costs. In an entertaining and funny article in the The Book Examiner, blogger Michelle Kerns turned her pen to the top 20 (or 21) most hated words a reviewer can possibly use... and she's completely right about the list, and about the "black hole" of reviews that such meaningless, empty words create. You'll have to read the article to get the whole picture. Though the article is written with a sense of humor, it is a worthy warning to herself and to any other reviewer out there, be it in the blogosphere or elsewhere. I will request the same thing here as Michelle did in her article: if you see any of these hated words in my reviews, please let me know. You'll be my favorite reader, I promise. In a bizarre twist following the foiled Christmas Bomber (in case you've been under a rock since December, you can read the story here), Transport Canada has now limited all carry-on items to a restricted list (which includes medical equipment, laptops, musical instruments, and small purses). Ok, I guess that makes sense. But - and you knew there had to be a but - the list of allowed items quite blantantly excludes books, magazines and newspapers. Don't get me wrong, I am all for safe flights, national security, baggage screening, limited items in carry-ons, etc (although it's a pain to find 3-oz cans of hairspray sometimes). At the same time, however, there is a point where it has gone too far - both because it starts to get absurd, and it makes for a really lousy flight. Really, between the prospect of no snacks, $8 drinks, $20 baggage fees (mind you, carry-on luggage is now extremely limited even outside of Canada) and only an in-flight movie to keep me entertained, Amtrak and it's absurd prices are starting to sound more and more appealing. For more information: National Post article, January Post blog. Thanks to LitDrift for posting the link!